I got an interesting question last night in preparation for the world cup. 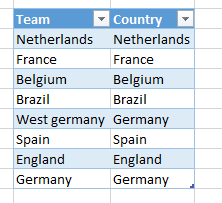 How can I get a PivotTable where I can see the results where the team selected in a slicer is either the Home or the Away team. Because we need to do show games where the Home or the Away team are selected here we cannot use traditional relationships. Talking to some of my colleagues we decided that there had to be a more optimal way. Taylor my colleague came up with the following, this doesn’t need any of the calc columns. 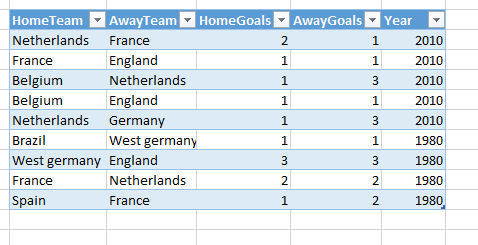 It will calculate the sum of HomeGoals for each row of the filtered Games table where the values of the Games[Hometeam] row CONTAINS the selected (by the slicer) Country[Team] column or the Games[Awayteam] row CONTAINS the selected (by the slicer) Country[Team].